We understand you may wish to keep your order private. Therefore on ALL our dispatched orders, we will ensure that there is no advertising whatsoever, nor any evidence giving rise as to what may be within the package which is delivered to you. For some countries, delilivering internationally - by law we are requested to use a customs declaration which will only briefly describe the product. An example would be “insoles”. 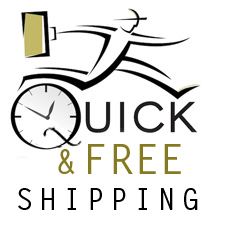 We ship most of our products free to the following countires: USA, UK, Canada, EU member states. If your delivery is late arriving, please contact us and we will check our dispatch department to confirm the status of your delivery. Very often it is simply a case that delivery has been attempted and a calling card has been left. It is our customers' full responsibility of providing 100% correct/complete address. Failure of providing the correct address may result in a delayed delivery of which we are not responsible. Returns information can be found on our Terms and Conditions page.